The Guardian has unveiled its first tabloid newspaper today with a new masthead and website redesign. All sections and supplements of The Guardian and its sister Sunday paper The Observer have been redesigned for the new format. Publisher Guardian News & Media has ditched the distinctive Berliner size after just over 12 years and outsourced the printing of the tabloid to Trinity Mirror in a cost-cutting move. There are now three sections of the main weekday paper: news, politics, international affairs and financial news in the main section, with sport starting on the back page. There is a new daily pullout section of opinion articles called Journal, and the familiar centre pullout G2 has also been redesigned. On Saturdays, The Guardian will include five magazines: a redesigned Weekend magazine, including some new features and columnists; Review, now a books magazine; the Guide; Travel; and Feast, a new 24-page food magazine. The Observer will now include Observer Magazine and The New Review. 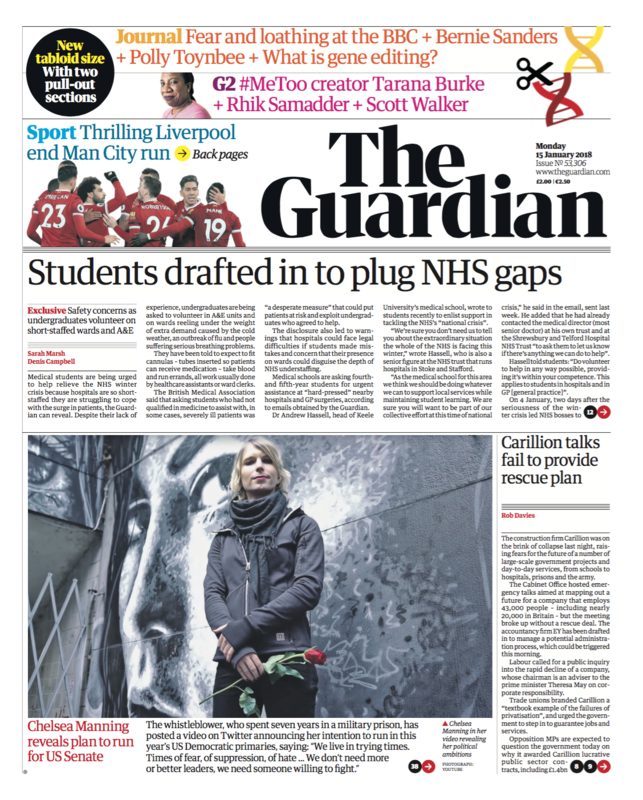 In an editorial comment on page 2 of today’s newspaper, Guardian editor-in-chief Katharine Viner described the new format as "bold, striking and beautiful". The Guardian’s new printing facilities at Trinity Mirror would provide improved distribution and is being printed from Watford, Oldham and Scotland for the first time, Viner added. David Pemsel, chief executive of Guardian Media Group, said: "The change to tabloid format is an important milestone in our three-year transformation plan and will save several million pounds. The media sector remains challenging. "However, our reader revenues are growing well, and more people are reading us than ever before – we now reach over 150 million unique browsers each month and we have over 800,000 supporters. "Our strategy to secure The Guardian’s future is on track. By April 2018 we will have halved our operating losses in just two years, reducing them from £57m to £25m per year, with the goal of breaking even in 2018/19." Ad industry sources told Campaign the publisher will take a significant hit on its estimated £20m a year in print ad revenue as they expect the new-look paper will no longer carry a full-page ad on the outside back cover on weekdays, although it should stay on Saturdays.